A quote on a window in a building at North Shore Community College. I was in this building today--I'm not in it too often and I saw this quote on the window. I have no clue if it has been there since the building's inception (several years back now) or whether it is relatively new. But I liked it and found it rather appropriate for the gray and rainy day that we are having. 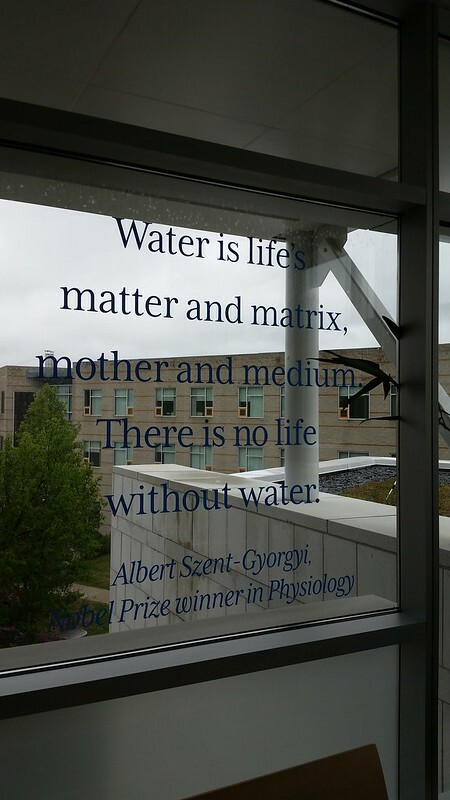 The quote is "Water is life's matter and matrix, mother and medium. There is no life without water." and is from Nobel Prize Winner (in Physiology), Albert Szent-Gyorgyi. I think we sometimes forget how essential water is because it is so disposable in a modern society and we forget how much effort it takes to keep our life-source clean and useful. It is a luxury still not accessible to many in the world.